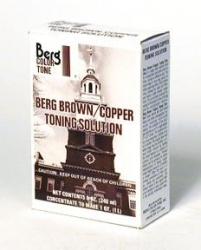 A single bath solution used for toning black and white prints or films. The tonal range is a warming effect, a brown tone, a sepia tone or a deep metallic copper tone depending on the time of toning and the nature of the photographic materials. The toner has been specially formulated to work well with modern papers, including resin-coated and variable contrast papers. The product has no offensive odor. Toned images are reversible, either partially or totally, simply by redevelopment in ordinary print developer. Liquid to make 1 quart. Up to approximately 75 single weight 8"x10" prints may be toned per quart.